Having never manufactured any sort of amusement device before, I felt that the art, and artist, needed to be a selling point. It couldn’t be just *any art* from *any artist*, it had to be iconic art from an iconic artist. I wanted an artist who would be immediately recognized by not only their name, but by their unique style; someone with a solid pinball pedigree. John Youssi (http://www.johnyoussi.com/pinball.html) fit the bill perfectly. There was a slight problem however; I did not know John! E-mailing a person of John’s stature in the pinball business and asking him if he would be interested in illustrating a pin game takes a bit of nerve, especially when you consider what games he has illustrated; Medieval Madness, The Addams Family, Whitewater, Whirlwind, Funhouse, Bride Of Pinbot, Twilight Zone, and Ripley’s Believe It Or Not, just to name a few. The internet is a wonderful place. I found John’s e-mail address on his web site and sent him a short note explaining what we were up to and asked him if he would consider joining the SGM team. I was not surprised that he answered my e-mail, but I was surprised when he said he would be willing to come out and take a look at our project. About a week later we were standing in front of the original Contact Master. At this first meeting I honestly did not have much to show him. This was very early on and we had only made a few 3D printed parts and not much else. John was very gracious and listened to my pitch. I suppose the whole project sounded just far enough *out there* that it peaked his interest. We tossed around some basic ideas of what we thought the art should look like. Being that the name ScoreGasm Master merits its own attention, I wanted the art to be pretty tame/classic, sort of a throwback to a bygone era. John suggested an art-deco-meets-pinup-girl look. This sounded like the perfect approach. A few weeks later John e-mailed me with a few first drafts. The art was near perfect from the start! 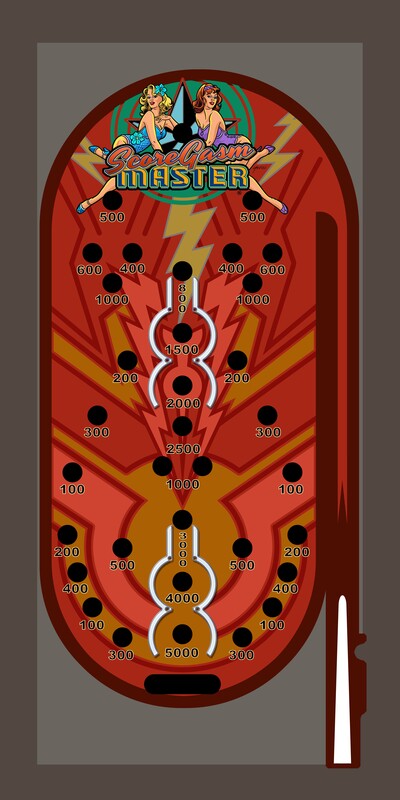 With only a few tweaks we soon had our cabinet and playfield art. John is a consummate professional, so having him on board for the art package on this project made what could have been a grueling process very fluid and easy.